May 13, 2012 - The Federal Aviation Administration (FAA) is awarding a contract to ITT Exelis and GE's Naverus to help accelerate the development of satellite-based procedures that will allow aircraft to fly more directly to their destinations. Under the $2.77 million contract, ITT Exelis, the prime contractor, and GE's Naverus, the sub-contractor, will develop Required Navigation Performance (RNP) approach procedures into five airports: Ted Stevens Anchorage International, James M. Cox Dayton International, Charles B. Wheeler Downtown Airport (Kansas City), General Mitchell International (Milwaukee) and Syracuse Hancock International. RNP is a type of performance-based navigation (PBN) that allows an aircraft to fly a specific path between two 3-dimensionally defined points in space. RNAV and RNP systems are fundamentally similar. The key difference between them is the requirement for on-board performance monitoring and alerting. A navigation specification that includes a requirement for on-board navigation performance monitoring and alerting is referred to as an RNP specification. One not having such a requirement is referred to as an RNAV specification. ITT Exelis and GE's Naverus will be responsible for designing, implementing and maintaining a total of 10 procedures, two for each airport. The FAA will closely monitor the work to make sure all safety and environmental steps are conducted properly. This effort will supplement the FAA's work to develop RNP procedures for airports across the country. The FAA has developed 305 RNP procedures. RNP also refers to the level of performance required for a specific procedure or a specific block of airspace. An RNP of 10 means that a navigation system must be able to calculate its position to within a circle with a radius of 10 nautical miles. An RNP of 0.3 means the aircraft navigation system must be able to calculate its position to within a circle with a radius of 3 tenths of a nautical mile. "If you imagine highways in the sky, then these are high-speed off ramps," said Acting FAA Administrator Michael Huerta. "Aircraft using RNP approaches make a more direct and efficient approach into the airport, also decreasing fuel burn." The FAA awarded the contract to ITT Exelis and GE's Naverus through a competitive process under the System Engineering 2020 contract, a portfolio of work designed to help the agency roll out NextGen. Fiscal year 2012 appropriations included funding for a contractor to develop and deliver NextGen procedures, and the FAA reauthorization bill called for the agency to demonstrate the ability of a contractor to design, implement and maintain these procedures. In 1996, Alaska Airlines became the first airline in the world to utilize an RNP approach with its approach down the Gastineau Channel into Juneau, Alaska. Alaska Airlines Captain Steve Fulton and Captain Hal Anderson developed more than 30 RNP approaches for the airline's Alaska operations. In 2003 they founded Naverus which is the world leader in helping deploy RNP and other PBN systems worldwide. In 2005, Alaska Airlines became the first airline to utilize RNP approaches into Reagan National Airport to avoid congestion. 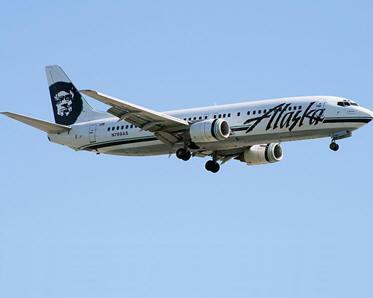 In April 2009, Alaska Airlines became the first airline to gain approval from the FAA to validate their own RNP approaches. On April 6, 2010, Southwest Airlines converted to RNP. In October 2011 Boeing, Lion Air and the Indonesian Directorate General of Civil Aviation, performed validation flights to test tailor-made Required Navigation Performance Authorization Required (RNP AR) procedures at 2 terrain challenged airports, Ambon and Manado, Indonesia as pioneering the use of RNP precision navigation technology in South Asia.